When we learned that electricity was a long way off, I decided it was high time to start really cooking rather than hastily heating up leftovers and hot dogs in the wood stove. Our exterior wood stove is singularly ill-suited for cooking, with a sleeve around the stove providing hot air to be blown indoors and also preventing the surface from reaching cooking temperatures. The inside is generally far too hot to cook in without charring. But I had nothing else to keep me busy, so I decided to create my own Dutch oven. I dug up an old roasting pan out of the barn, set it up on a cinderblock, and filled it with hot coals shoveled out of the wood stove. A pizza pan fit well on top, and a big lid enclosed the heated surface. I had moderate luck "baking" chocolate chip cookies but great luck frying up bacon. Maybe the latter tasted so good because of the bit of leftover chocolate melding with the bacon juices? Meanwhile, I was starting to get worried about our water situation. We still had seven jugs of drinking water, but I could easily see us running out and the dirty dishes were stacking up. I was pleased to discover that packing a pot full to the brim and then half again as high with clean snow melted down to a nearly full pot of warm dish water in three hours on the wood stove. I added a bit of bleach for safety and revelled in the feel of warm water on my hands as I cleaned up the dishes. 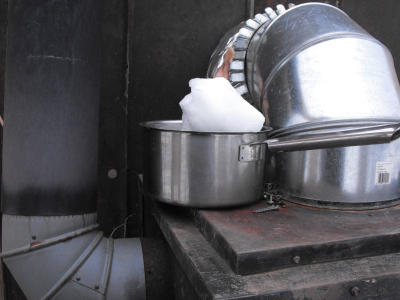 In a pinch, we probably could have gotten away with drinking the melted snow, but our generator made that unnecessary. We've allotted ourselves an hour and a half of generator time every evening, plenty of time to turn on our drinking water pump and UV light to fill up another dozen or so milk jugs. And time to feed my blogging bug! This is the last installment on the Monday CD. Stay tuned for more details soon (I hope.) Meanwhile, check out our microbusiness ebook.